Sidney Slon/Pipe Dream Photographer BU students competed in “live-action” horse racing for a cause at the “A Night at the Races” event on Feb. 7. The horses lined up along the starting line. Families, children and local businesses sat on the edge of their seats, waiting for the race to begin. The air was tense and the competition was fierce, but in the end, it would all be up to the roll of a dice. Were we at the Kentucky Derby? Nope, we were competing on a life-size board game at Binghamton’s third annual Night at the Races event. Students, staff and members of the community gathered at 7 p.m. on Thursday, Feb. 7 in the Events Center. The event was held by 18 student leaders in Binghamton’s leadership institute Explore, Engage and B You (EEBU), which promotes healthy choices for college students. The College of Community and Public Affairs program and School of Management faculty worked in collaboration with EEBU to promote and run the event. Ultimately, the goal was to raise money for charities in the local community. In five different rounds, teams consisting of students, student-athletes and members of the community competed in stick-horse races in an event that ran for about 90 minutes. After five rounds, the top three teams would choose which charity they would donate the event’s raised funds to. The stakes were high; each team had paid $20 to register and seemed eager to obtain victory for their chosen cause. The atmosphere was positive as teams cheered on their representatives and competed in miniature games in order to stay in the race. The race was a life-size board game, where a representative from each team was allowed to move as many spaces as the dice roll allowed toward the finish line. Upon landing on a square with a colored band, teams elected another representative to test their skills in a mini game, each representing a different sport on campus. Whether by throwing tennis balls into a lacrosse goal, bouncing a ball on a tennis racquet for 15 seconds or making three out of six baskets, each team was tested on both their coordination and athletic abilities in order to keep the race fun and lighthearted. A poll was even available online for which team was most likely to win on the big score board. After two championship rounds, the winners were decided and a total of $619 was raised for each of the top three teams’ charities of choice. As winners, the baseball team was allocated $371 that would go toward the Addiction Center of Broome County. Coming in second place was women’s cross country, who allocated $155 toward the Center for Donation and Transplant in honor of late graduate student and cross country runner, Noah Farrelly. Men’s cross country, placing third, was allocated an additional $93 toward this fund. EEBU member Maya Haykal, a member of the women’s tennis team and a junior majoring in biology, helped organize and plan the event. Jaclyn Smith, a member of the volleyball team and a sophomore majoring in economics, competed in the event along with her whole team. “It is always an amazing feeling to be part of an event where both the athletics community and the Binghamton community can come together and raise money for a good cause,” Smith said. This year, EEBU made an effort to advertise the event to not just athletes, but members of the wider community. As such, a vast diversity of students, staff, local businesses, families and children attended to either compete, support their favorite teams and eat some of the pastries, cookies and other desserts offered. The Binghamton community will see this event, which is funded by the National Collegiate Athletic Association, continue to develop in the future. 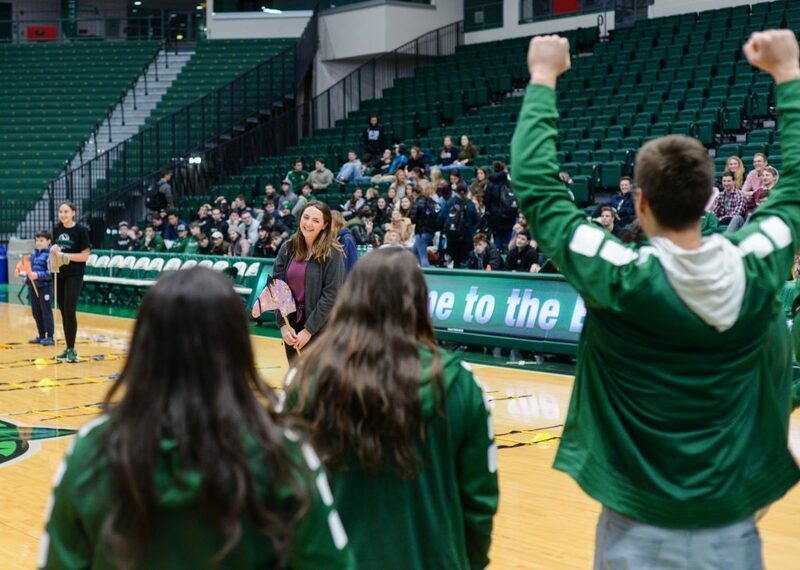 Kristie Bowers, assistant athletic director for student-athlete support and development, said the event allowed the Binghamton student body to come together for a common cause.